Hello everybody and welcome back to the Everything Ham Radio Podcast! In this episode we are going to talk about building antennas, we talk about some upcoming events/contests and hamfests over the next two weeks and wrap it up with some news from around the hobby! I would like to thank George Zafiropoulos, KJ6VU with Packtenna.com, Dan Romanchik, KB6NU and Scott Davis, N3FJP for donating items for give-away prizes for this episode. N3FJP Software Package – Up for grabs, listen to find out how to win it! The first questions that you have to answer when you are going to be building your own antennas, is what frequency is it going to be on? Is it going to be a VHF, UHF, or HF antenna? Is it going to be a multi-band or a mono band antenna? Once that question is answered, the next question you need to answer if do you want it to be a directional or omni directional antenna? More than likely, the first antenna that you will need is one that you can use on VHF and/or UHF. Since probably the majority of hams start out with just a technician license, they won’t have access to the HF bands. If you start with just an HT, then more than likely you would need some kind of external antenna outside your house to be able to talk on your local repeater. So here is where the next question come in, Should you do an omni-directional antenna or a directional one? If you are going with the cost efficient route, an omni-directional antenna would be your best bet. Now, since here in the US we use Imperial Measurements, we have to change meters to feet, then to inches. Now, having 80.9 inch elements on your ground plane is going to make it HUGE! In order to help with size of it, you can divide that number by 4 to get a Â¼ wave antenna, which would bring the radials down to 20 1/4 inches in length. The radials should be 5% longer than the driven element so you can basically cut four pieces at the 20 Â¼ inches and one at the 19 Â¼ inches and it would work fine. The J-Pole antenna is an antenna that looks like a â€œJâ€! It is also an antenna that works really well, when in all reality it shouldnâ€™t work at all. The long part of the J is a Â½ wavelength of the frequency you’re going to be using it on, the short part of the J is Â¼ wavelength of the frequency. All the length measurements will then have to be multiplied by 12 to get the length in inches. Make sure that you use a good conductor pipe for this antenna. A Â½â€ copper pipe is great for this. Arrow Antenna sells a dual band antenna that you can buy for about $50-60 I believe and it works great. I have used mine for 10+ years and haven’t had a lick of problems with it and the SWRs are great out of packaging. Unfortunately, at the time of this episode, their website is down, however, you can purchase it through Ham Radio Outlet for about $60. Directional antennas are a whole different beast when it comes to designing and building. There are a bunch of plans out on the internet on how to build one. I highly recommend that you use a program to help you figure out the length of each element and the boom rather than doing it by hand. Better yet, use a plan that someone has already made and build the antenna from those specs. I found one set of plans that looked really good and looked pretty each to make as well. It also showed two different ways of attaching the tuning or gamma match element to the antenna. Click here to check out the plans and step by step instructions on how to build it. Dipoles are one of the easiest and most commonly used antennas on HF. They can be used in several different configurations as well, Straight, Inverted V, Slopper, etc. A dipole is basically just a long piece of wire with a coax connected to it. If you plan your antenna right, you can use it without needing a tuner to maximize your power output. Just like with the VHF/UHF antennas, you could do your calculations for the center of the band that you want to and use a tuner on the fringes of the band. If you normally hang out on a certain frequency, you can tune it to that frequency and not have to use a tuner, therefore giving your the maximum power possible. Just like with VHF/UHF, yagis are another major type of antenna that is used on HF. The difference between HF and VHF/UHF yagis are the polarity. VHF/UHF are vertically polarized, whereas HF is horizontally polarized. The difference in the polarization is what allows your signals to bounce of the atmosphere better. Another major difference between the two bands is the size of the antennas. Of course the overall size is bigger because the frequency is lower and the element diameter is bigger as well in order to support the length of the element. While there are other types of antennas that can be used on HF, these two are probably the easiest, with dipoles being a whole lot easier than the yagis. The beauty of HF frequencies though is that you can use almost anything to make an antenna. I have heard of people using a fence, a rain gutter, or a handrail as an antenna. Let your imagination go and try it out. As long as you limit your power and your have a tuner, you never know what could be used for an antenna or how well it will work until you try it. Check out the Ham Universe website for some great antenna ideas. 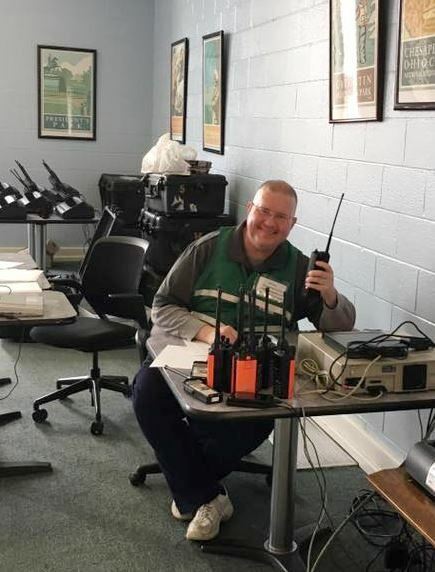 Jeff Dahn, KB3ZUK, of Rockville, Maryland, activated every available NPOTA unit in the Washington, DC, area during the year-long National Parks on the Air (NPOTA) program. That, and his prior DC-area law enforcement experience, gave him a leg up to snag a gig during the presidential inauguration and the Womenâ€™s March on Washington as a radio operator for the National Park Service (NPS). 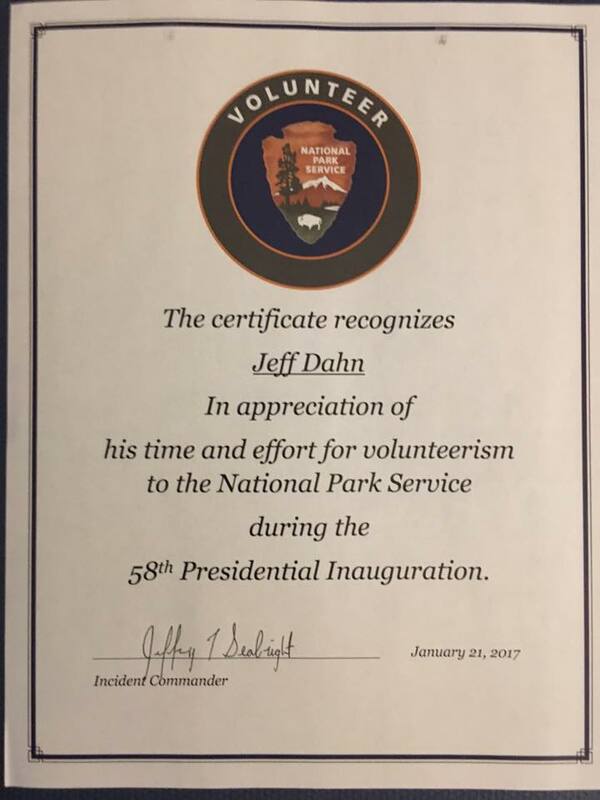 Dahn, an ARRL member, spent 32 hours over the course of 3 days as a volunteer, operating park service radios from NPS Headquarters. 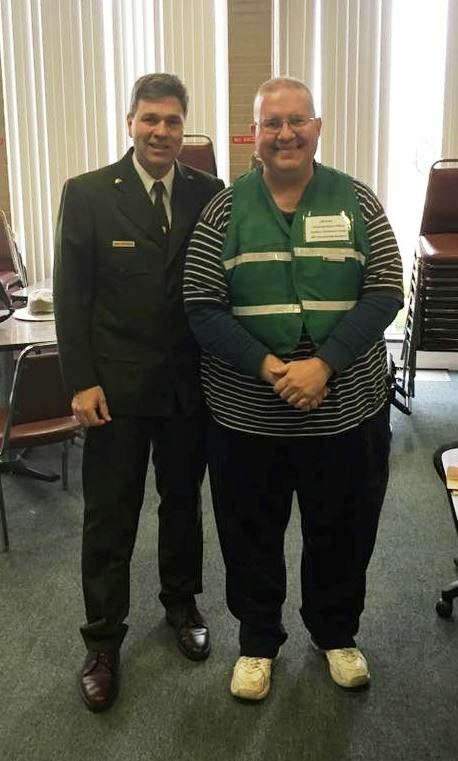 â€œI was invited to serve as a communications officer during the inauguration at the NPS Incident Command Post at their Headquarters facility as a direct result from participating in NPOTA,â€ Dahn told ARRL. In appreciation, NPS gave Dahn a certificate, a reflective service vest, scarf, and hat, plus he got to meet acting NPS Director Michael Reynolds. Dahn said the climate-controlled, access-restricted environment was a far cry from his first presidential inauguration experience on January 20, 1993, while serving as a law enforcement officer. â€œI remember standing at parade rest for what seemed like hours on the parade route between the crowd and the street, facing the crowd, not the procession while hungry and freezing,â€ he recounted. On his second day, Saturday, January 21, Dahn was up very, very early, and involved with â€œcoordinating planning with local point folks involved with the Womenâ€™s March on Washington (WMW). Just elected president of the HacDC Amateur Radio Club, Dahn was able to give the okay for his clubâ€™s W3HAC facility to serve as the net control station site for Amateur Radio operators helping those arriving for the march. â€œ[T]hat facilitated another connection between the NPS Dispatch Center HQS Incident Command Post and the volunteer Amateur Radio NCS, who were both communicating and working with their stations in the field as the â€˜boots on the groundâ€™ on both sides of the equation!â€ Dahn observed. Dahn said it was an honor and a privilege to serve as a volunteer. â€œIt was amazing to have been given the chance to participate and to have been so closely involved with such an amazing event,â€ he told ARRL. â€œMade it! 80 Years a ham.â€ Thatâ€™s how ARRL member Paul Elliott, W5DM, of Hobbs, New Mexico, recently posted his milestone on the Top Band reflector. Growing up during the Great Depression in Kingsville, Texas, Elliott got his ham ticket at age 14 as W5GGV. Now 94, Elliott eventually worked his way to the top rung â€” Amateur Extra â€” back in the day when that license offered no additional privileges, just prestige. It did later allow him to apply for a two-letter suffix call sign, and he became W5DM. His first rig was homebrewed from Atwater Kent radio parts, with a wire to a tree for an antenna, but he remembers making his own galena crystal for a crystal set and experimenting with a Model T spark coil. He continued building his own transmitters and receivers for a couple of decades, operating CW until SSB came along. Elliott succeeded in working all states on 160 meters from a 120 Ã— 120 foot electrically noisy city lot with â€œa long but low semi-inverted L,â€ as he described it. He now has 189 DXCC entities confirmed on Top Band. 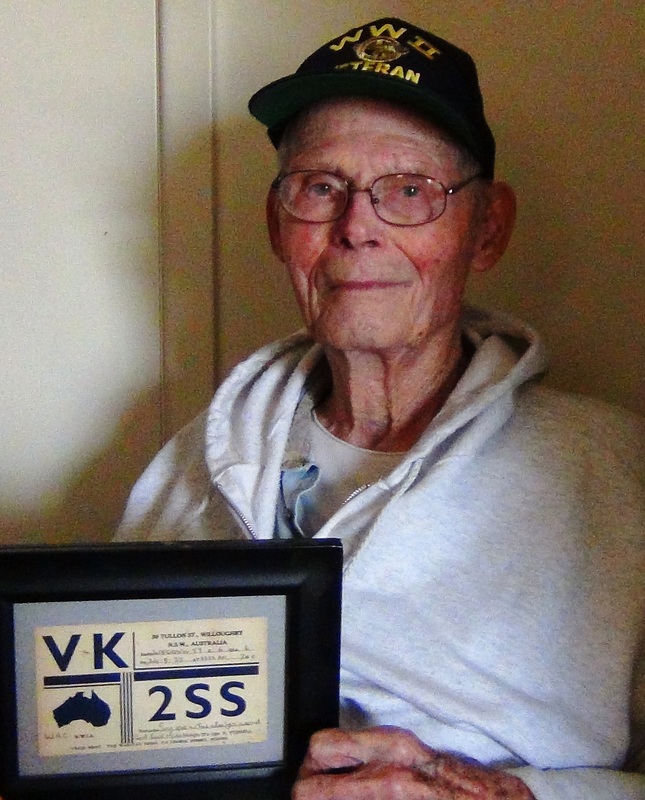 A Texas native and World War II veteran, Elliott is a graduate of the US Naval Academy and served in the Pacific. After the war, he was a Navy aviator. In the late 1940s, he began farming cotton and maize, which he continued until 1980 on 200 South Texas acres, then taking on a second job as a chemical plant engineer, before going back to school to earn a doctorate in physics from Texas A&M. â€œIâ€™m basically a peasant with a lot of education,â€ is how he describes himself. He spent more than 20 years in academia as a professor of physics at his alma mater. In addition to Amateur Radio, Elliott enjoyed flying and was a licensed commercial pilot. â€œBasically, all Iâ€™m doing today is chasing the occasional DX,â€ Elliott told ARRL. He said he has a transceiver and a couple of wire antennas that he makes work on all bands. Elliott has 325 DXCC entities confirmed on all bands â€” plus a lot of memories from an earlier era of Amateur Radio. He recalled a fellow ham in Texas who had directly coupled the final tube of his transmitter, with 1,500 V dc on the plate, to his antenna. When he received a â€œpink slipâ€ (advisory notice) from an FCC monitoring station in Hawaii for harmonics, his friend saw the bright side and bragged about the distance his signal had traveled. â€œAge, not surprisingly, has taken its toll,â€ Elliott said on the Top Band reflector, noting that his CW speed was now down to 20-25 WPM because of waning dexterity. â€œThanks to all who have had the knowledge and the kindness to help me over the years,â€ he said. AG1LE wrote a pretty interesting article on his blog about a proof of concept project that he is doing about using the Amazon Echo to control his Elecraft KX3 remotely. He talks about using it to do things like listening to podcasts, getting the most recent DX cluster information, getting APRS information and more. It is a pretty neat concept. It is still in the Alpha phase so it is still pretty fragile but he says that once it gets more stable he is willing to put it on github if there was interest in it. Head over to his blog and read the full article and let him know what you think about it. Click here to read the full article.